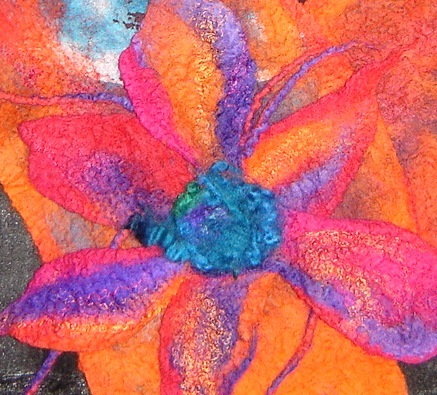 Felted work is made using wool sliver (sheep, alpaca, mohair, etc), silk and other fibres. This sliver would have been washed and cleaned before and then put through a carding machine so that all the wool fibres lie the same way. The carding machine straightens and combs the wool fibres. The majority of my work is made using a technique called "nuno" felt. Nuno felting is when wool fibre is felted through fabric to produce a lightweight material (like a sandwich). The materials used are usually woven, like silk, cotton etc. Nuno felt is usually quite light . 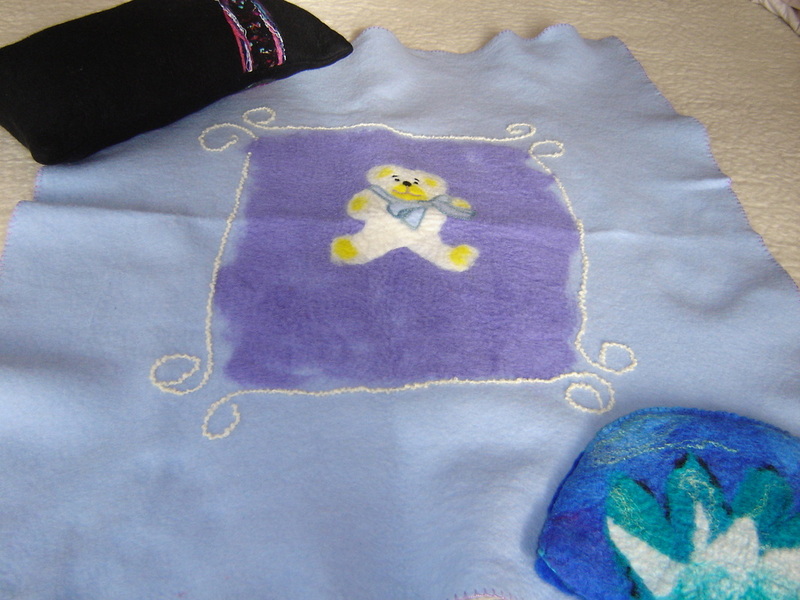 Needle felting is another method of felting wool sliver and this is done by using special needles. Also silk sliver, hankies, and fibres, etc, may be used to felt. I have also incorporated some of my muka in needle felting and found it worked well. You may check my Blog where I have been talking about my project which involves felting and flax weaving together to create a dress. 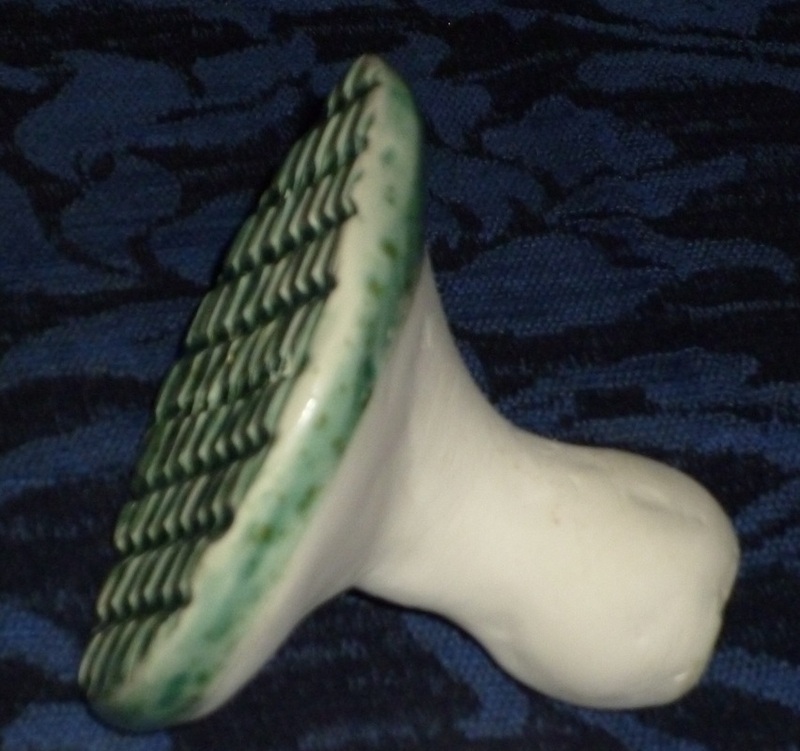 Hand wash using a mild soap like wool wash.
Dry in shade, it may be ironed with iron on wool or silk setting. Colours may vary from blue to green, or yellow. Price: None left at present. 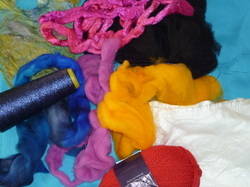 I mainly use merino wool in my felting but always add other fibres like silk, sari silk, threads, etc. and lately the fibre of the New Zealand flax. At times I use alpaca which is a warm wool just a bit more fluffy. The shine parts of the felt work is where silk was placed. You may also see the blue of the fabric used to nuno felt on the top left corner. Wool fibre has a scaly surface and with friction, soap and warmth the wool fibres look for each other and join together to felt into a strong fabric.